Saturday night I was not in the mood to go out and party. I was seeking time for myself. Time to think. Time to heal. 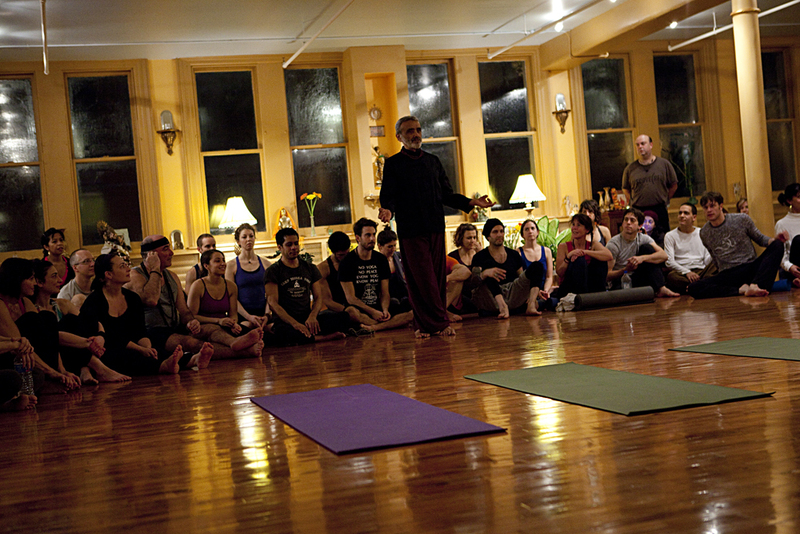 My Yoga Guru Sri Dharma Mittra was hosting a Sadhana class on his new studio on west 23rd street in Manhattan and I could no think of better place to be than there. I wasn’t wrong. The energy and the karma generated by 100 plus people practicing and chanting together mat to mat in the same room with the same intentions was ecstasy in its most pure form! I am no only talking the Yoga talk. I felt the healing force of others helping me clearing my mind. I walked out of that studio on a mild Saturday night with a spotless mind and a calmer breath. I teach Yoga and I live the Yoga life, but sometimes I forget what a gift I have been given to pass along to others. I feel blessed every time I am reminded by so many similar beings what it means to be a Yogi and how important it’s to keep growing along in this path of self-awarness. And dedicate this growth not only to yourself, but to the ones who got you to this point. That’s why in Dharma’s class we chanted Hare Krishna for half an hour while people were jumping in a circle and striking poses as dedication to their supreme beings or the portion of G-d (whichever this may be for them) inside themselves.